Illegal is illegal no matter how minor the infraction. This year in Saratoga Springs, ICE arrested 36 Mexican and Guatemalan men, many of whom worked in local restaurants. Mayor Joanne Yepsen, City Court Judge Jeffrey Wait, other leaders and concerned citizens said immigrants accused of minor infractions should be treated differently from those facing felony charges. The arrests, which began in the spring and went through the fall, rattled the hospitality industry. Farther afield, dairy farmers were shaken too. Feeley’s field office made 1,736 arrests in the 2017 fiscal year from October 2016 through September 2017. 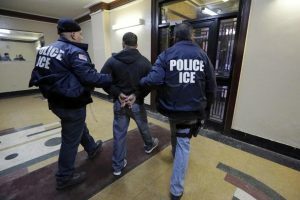 In the previous year, Buffalo ICE arrested 1,454. In general, monthly arrests of noncriminals were half of criminal arrests – except this past September when criminal and noncriminal arrests in upstate New York were equal at 81.